The Volvo demo front is equipped with a plumbed water system that is controlled back at the cab and releases water at the face of the RockWheel, effectively knocking down the concrete dust. 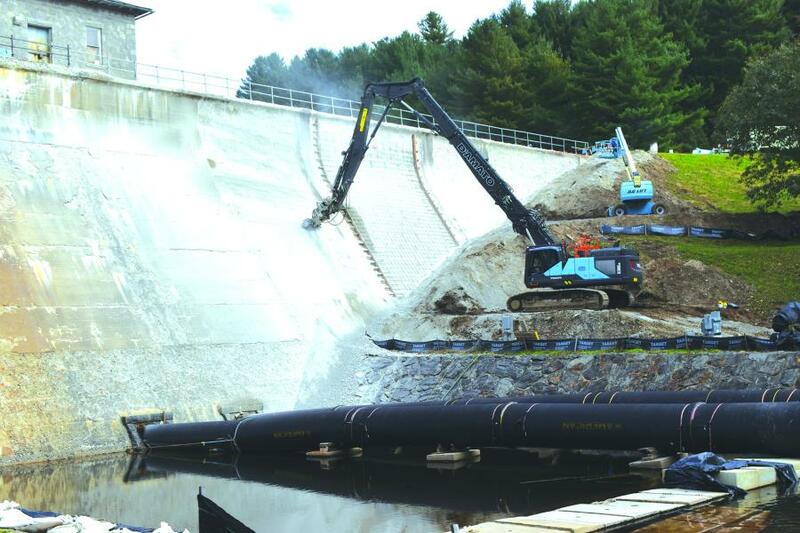 Resurfacing a dam that is 450 ft. long with 100 ft. of main spillway might be a daunting task to some. But D'Amato Construction is up to the challenge. Shepaug Dam, which is owned by the city of Waterbury, Conn., was constructed in the 1930s. 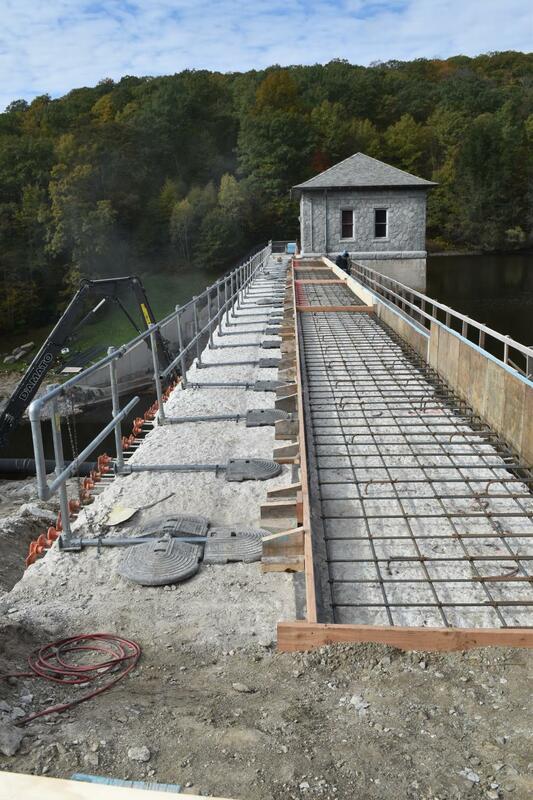 D'Amato Construction is on the site to reface the entire dam, removing 6 in. of surface and replacing it with new rebar and concrete, which, according to D'Amato, should make this dam good for another 100 years. The project was started in June 2018 and is scheduled to take two years for completion, with a total value of $2.8 million. D'Amato Construction, was founded in 1961 by Edward D'Amato Sr. and his wife, Patricia, and his brother, Anthony (Tut) D'Amato. Today, along with their father Edward Sr., Edward Jr., Thomas and Sue operate the daily functions of the enterprise and are welcoming the third generation. D'Amato Construction currently has 35 employees. The company has a truck and equipment inventory of more than 100 pieces, which includes a fleet of 20 excavators that range in size from 10,000 to 100,000 lbs., all of which are Volvo machines that were purchased from Tyler Equipment. And every one of those pieces of equipment, from pickup trucks to excavators, has a unique paint job. "That is something that my father insisted on early on in the growth of our company," said Thomas D'Amato, vice president. "We call it ‘D'Amato Blue or Quality Blue.' Every one of our pickup trucks, service trucks, excavators, dozers and loaders all have been painted to reflect our company's Quality Blue color." The latest addition to the D'Amato excavator fleet is a Volvo 380E HR 120,000-lb. tracked excavator that is equipped with a 76-ft. high reach boom. The excavator was purchased specifically for this project. The high reach boom has a unique Volvo design that allows the boom to be changed out to a digging boom in a very easy process that involves the release of four pins and the quick disconnect of some hydraulic hoses while the entire high reach is positioned in an elevated cradle specifically designed for this purpose. The Volvo, which is specifically designed for high reach demolition work, also features a tilting cab to improve the operator's visibility, allowing operators to keep their eyes on the business end of the stick and maintain a comfortable position and access to controls. "When we bid this project, we anticipated that we would need to build scaffolding, use boom lifts, and a crew of about 20 people with handheld chippers to execute the task at hand," D'Amato said. "However, working with our sales rep Tim McDermott, from our local Volvo dealer Tyler Equipment, we were able to develop a plan to mechanize the entire process using the new Volvo excavator,"
With today's environmental rules, placing an excavator in a fishing stream at the base of a dam will not be permitted under any circumstances; plus, in this instance, the face of the dam is contoured. 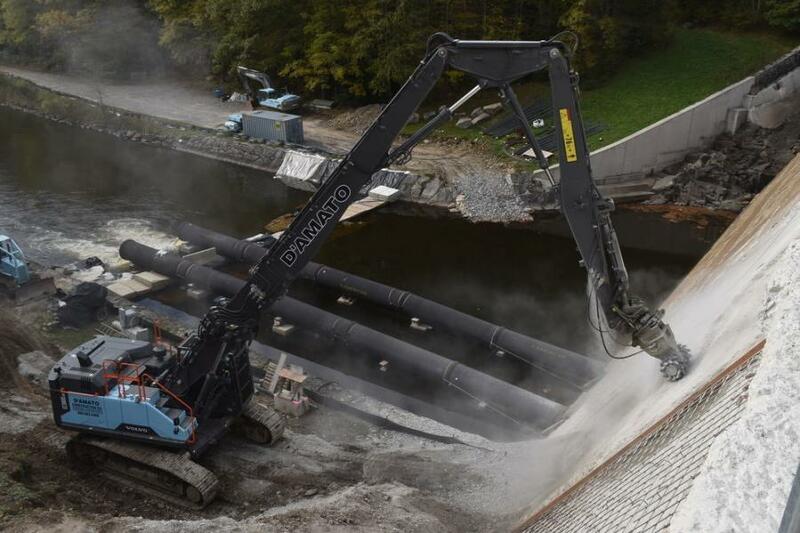 Even if the excavator could be placed in the water, it would need to be constantly moved to adjust for the various angles and contours of the dam wall, D'Amato explained. "The key was putting a Steelwrist tiltrotator at the business end of our stick, which has a RockWheel hydraulic rotary cutter," he said. "The critical piece of this equation was the Steelwrist tiltrotator. A tiltrotator allows the attachment at the end of the stick to have 360-degrees of rotation and up to 45-degrees of tilt. "What this essentially means is if we can get that attachment to the face of the dam from virtually any angle, we can have the grinder meet the wall perfectly square and accomplish the task at hand without the danger and the cost of putting twenty people on the face of the dam and get the project done significantly faster." A significant advantage to the new Volvo excavator with its demo RockWheel front is the built-in dust suppression system. 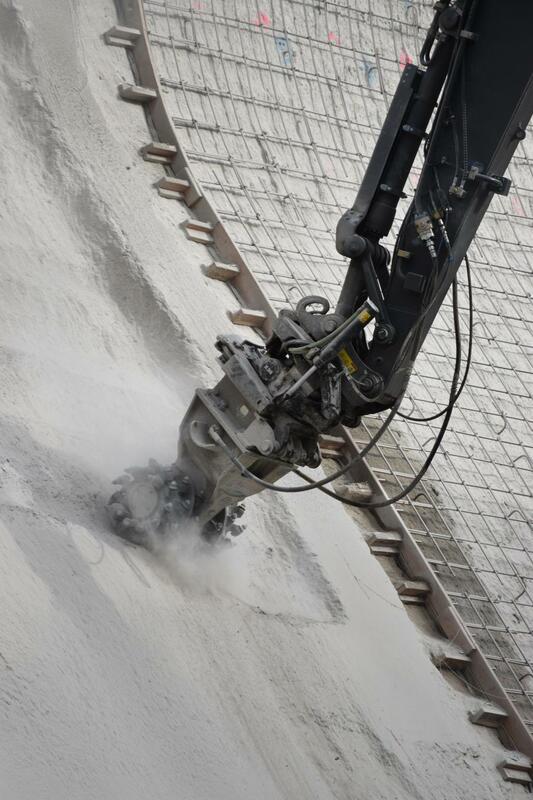 This system virtually eliminates the dust created by the demolition process. This system creates a safer workplace for the operator and crews on site. The RockWheel that is grinding all day long at the face of this dam is working remarkably well, according to D'Amato. "As would be expected we have to replace three or four teeth a day, but the RockWheel is designed in a way that teeth can be changed out in a matter of seconds," he said. "Of course, it is critical that the unit be lubricated three or four times a day." D'Amato Construction has been a loyal customer of Tyler Equipment for decades. 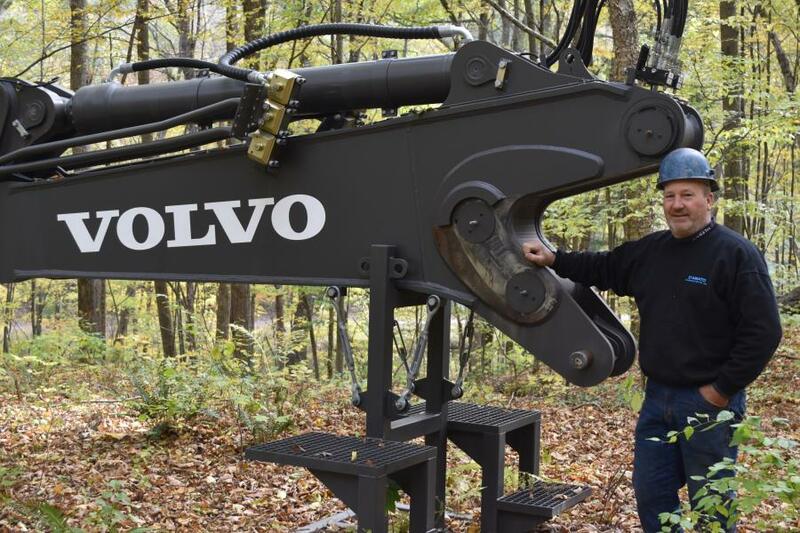 "Our first purchase from them was a VME loader [Volvo Michigan Euclid] followed by the purchase of an Ackerman excavator," he said. "Over the years, these product lines evolved into what is known today as Volvo, a brand that we recognize for its durability, speed and power. Along with the great Volvo products has come excellent employees like Tim McDermott, our sales rep, and the excellent staff of parts and service representatives. Tim is like a part of our family. His knowledge is invaluable to us." About D'Amato Construction Co. Inc. When Edward, Patricia and Anthony D'Amato founded the company, their work included new home construction and additions to existing homes. In 1970, the company started building up its fleet of heavy equipment and moved its focus to larger projects. As the company grew, much of the focus was on municipal and governmental projects such as water treatment plants and pump stations. Today D'Amato Construction is a full-service firm, specializing in commercial, industrial, institutional and luxury residential construction. The company also works in athletic and recreation; banking and financial facilities; childcare facilities; educational facilities; environmental management; food service; healthcare facilities; historical; municipality and government facilities; parking management; petroleum construction; and treatment facilities. D'Amato also tackles road and street construction, resurfacing and bridge work, as well as the sitework required on all of its projects. "We are equipped to handle all aspects except for electrical," Thomas D'Amato said. "Besides heavy equipment operators and skilled laborers, we have our own staff of engineers, estimators, carpenters, interior tradesmen and plumbers. Beyond governmental work, we also have a lot of private customers. 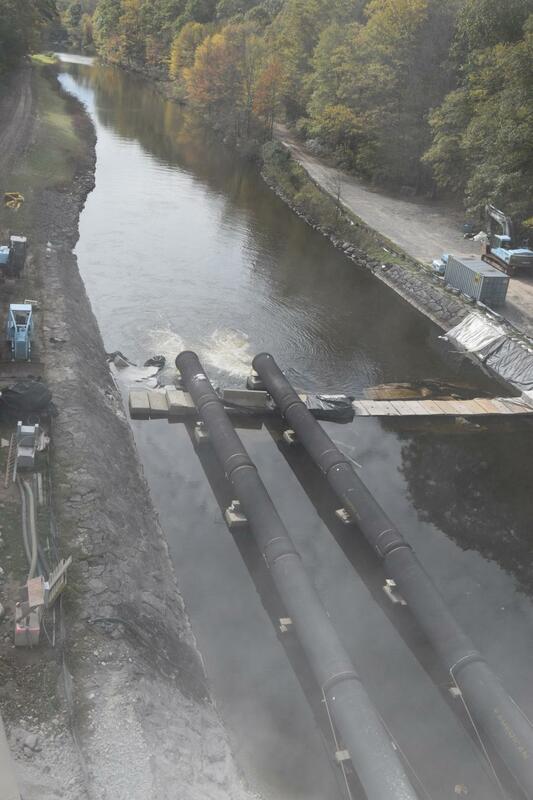 We are currently involved in multiple projects for Connecticut Water Company as well as the renovation of multiple facilities for Key Bank in two states." D'Amato has specialized in working with concrete for more than 50 years and is known throughout New England for quality, detail, finish, level and plumb, according to its website: "Concrete comes in many shapes, sizes and colors. At D'Amato, concrete is not just a task but a skilled art that we have mastered. It is our highly skilled and trained staff that make concrete our pride and joy. From our secret methods to our patented tools of the trade, we stand ready for any concrete project regardless of size and/or scope." For more information, visit www.DamatoConstruction.com.